We had been approached by Fauna Productions to use our balloon in a TV episode of "Skippy the Bush Kangaroo". For certain difficult shots impossible with the real balloon, my former student, Gary Isaacs and I, built a scale model of EGO. It was about 8 ft in diameter and represented a great deal of work. We even simulated the tapes on the envelope. 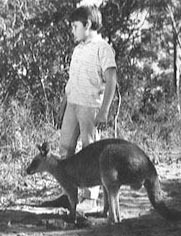 There was a little basket, with a minature Sonny and Skippy. 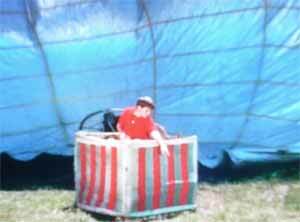 Inside we had a polythene bladder filled with helium. "The balloons coming down! We'll have to jump!" 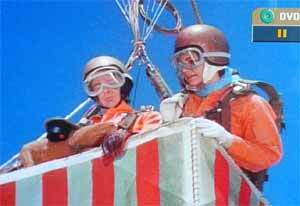 Ken Bath and I made a parachute jump for the film. 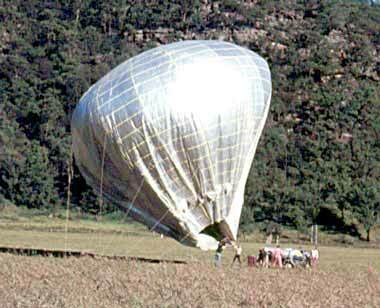 In the script, the jump was out of the balloon but we actually dropped out of a Cessna 180. 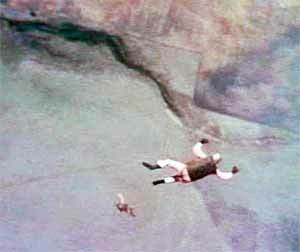 Ken is below me here.......Later, .Ken made a second jump with a dummy kangaroo strapped to his chest. Look down there Skip. We'll have to jump! The cameraman hangs from a Crane for the Shot. Sonny accidentally turns on the balloon burner and it lifts off. Shooting the scene, as EGO fills and lifts off. On this final day we went to the Hawkesbury river, just north of Sydney for the final scene. EGO was launched on shore. 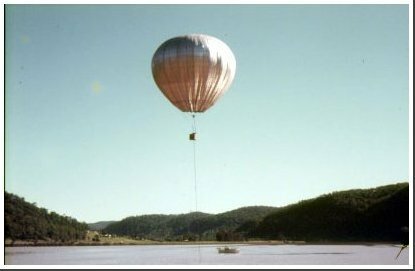 The key scene was to show Sonny and Skippy in the balloon drifting out over water. EGO climbed very high over the water. In the story, it was drifting out to sea. 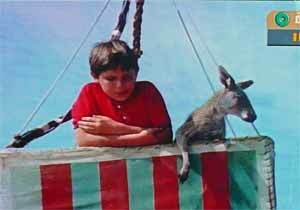 There was a dummy kangaroo peeping over the edge of the basket. Cameras were positioned on cliffs above the river to capture the scene. Both the drag rope and tether rope can be seen here. The filming went on and after about 20 minutes EGO began to lose height. It was a beautiful sight as it drifted lazily over the placid river, however something had gone wrong. Whether the cap had moved, or tapes given way, we're not sure. A safety boat came in and the crew transferred safely to it. EGO drifted past the tether boat, still attached by tether lines. There was danger of the lines fouling the propeller. 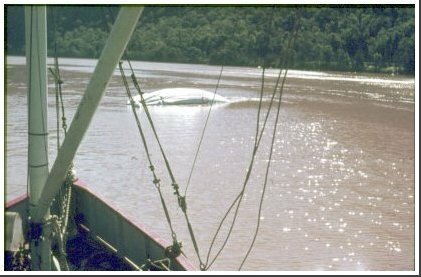 We let it drift, until the extended lines finally swung it back into the shore.We towed it slowly to the river bank, however the tons of water trapped inside made it a difficult process. In the middle distance, a gas cylinder is floating, still attached to the gondola submerged below. 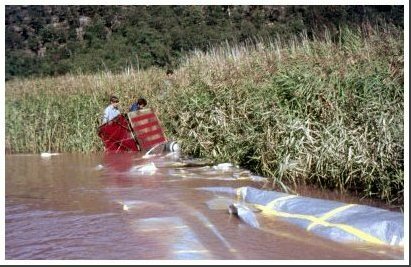 However unfortunately, the envelope was towed rapidly out of the river by tractor causing the massive weight of water inside to tear it to shreds. It was a sad, perhaps avoidable end to EGO. 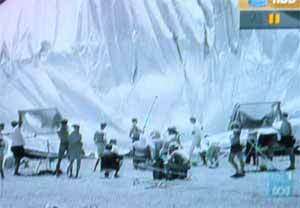 When the model balloon was not in use, the film crew kept it under a large net. One day it escaped from the net due to a gust of wind. A few rifle shots were fired but had no effect and it sailed off rapidly into the distance. 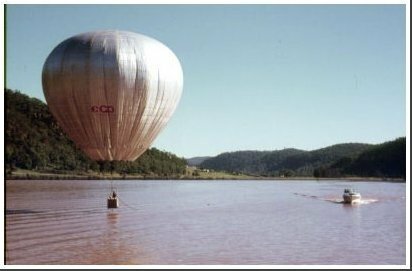 I was told that just minutes later, two RAAF jet fighters suddenly swooped low over the area heading off towards the now departed balloon. 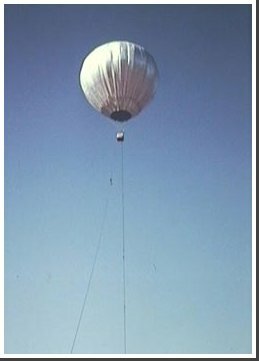 Being made of aluminium coated polyester, it was an excellent radar reflector. Our little EGO was never seen again. Although the episode was the most expensive in the series, it was a great success. It was named "Up and Beyond."